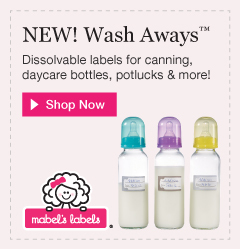 Mabel's Labels has just launched their new line of Wash Away Labels. These labels are perfect for potluck dishes, bottles for daycare, frozen foods, canning jars, and much more. When the labels are are no longer needed, simply pop in the dishwasher or under running water to rinse off. Best of all, these labels disappear completely, leaving no sticky residue.